It is believed that the sound of the Celtic harp, sometimes called the lever harp or folk harp, is so melodious that it is akin to the music heard in the heavens. With deep roots in the traditional history of Ireland, the Celtic harp is a rather simple looking wire strung Celtic musical instrument that requires one to possess great skill and the patience of a saint to practice long hours in order to play like a professional. If you want to learn to play the harp flawlessly, there are certain steps that must be followed to ensure that the tone is good, the right technique is being used, and the ornaments are properly arranged. Here, we have created a simple outline for you to get started learning how to play the Celtic harp in 6 easy steps. 2 Step 2: Thumbs Up! For beginners, the harp is played using the thumb and the first three fingers only. Since the pinky finger is too short, it stays tucked away and is rarely used. The only time it is ever used while playing is when the whole hand is used to do glisses (playing an entire octave of strings) or damping (stopping the vibrations of the strings). When playing the Celtic harp, finger numbers go from 1 – 4, starting from the thumb regardless of which hand you are using. 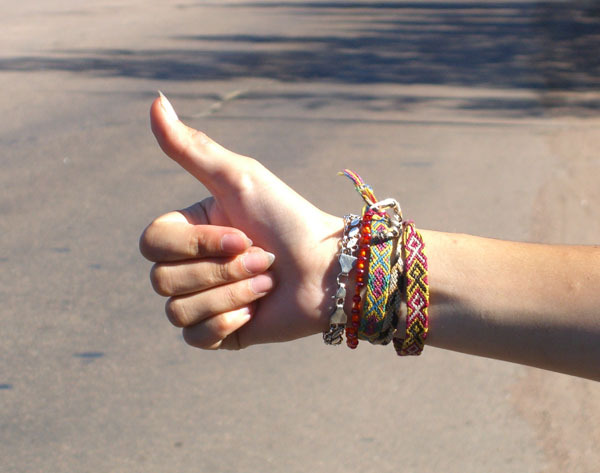 Your thumbs should always be up as if you’re making the hitchhiking sign. It should be positioned to stay above the other fingers, and you must maintain this position as it will enable you to do crossovers. A “crossover” is used for moving along the harp smoothly by keeping your thumb above the fingers or by crossing your fingers underneath the thumb. A great example of crossovers can be seen in this Celtic harp tutorial by Josh Layne (we highly recommend subscribing to his channel as he has several great videos). Always keep your hands relaxed and open as if you’re holding a glass of water or a piece of rolled up paper. Your hand should never be stiff or you won’t be able to play the Celtic harp properly. Certain techniques, including the classical technique, requires your hands to be positioned in several different angles, however you must always keep your hands opened and relaxed. When you pluck, try to close your fingers into your palm to give good leverage as well as prevent your finger muscles from stiffening up. To master this technique, think as if you have a very delicate butterfly in your hand as this will help you close your hand into a flat, loose fist. When you play the harp, try keeping your elbows out from both sides so there remains enough space between your arms and body. Following this technique will prevent your wrist from bending in an awkward position while your arm muscles will stay free and loose. Another important thing that beginners should keep in mind is the distance between the harp and their body. If you find yourself having to contort your body awkwardly in order to reach the harp, you may need to bring the harp closer to you. Place the harp at an angle where you don’t have to twist in order to see the strings. The seating arrangement plays an important role in this so you may need to use a seat riser if the harp is too low. Last but not the least, your wrist should not bend for it can lead to repetitive strain injury or carpal tunnel syndrome. In order to prevent harp-related injuries, always keep your wrist straight, your hand open and your elbows slightly up.